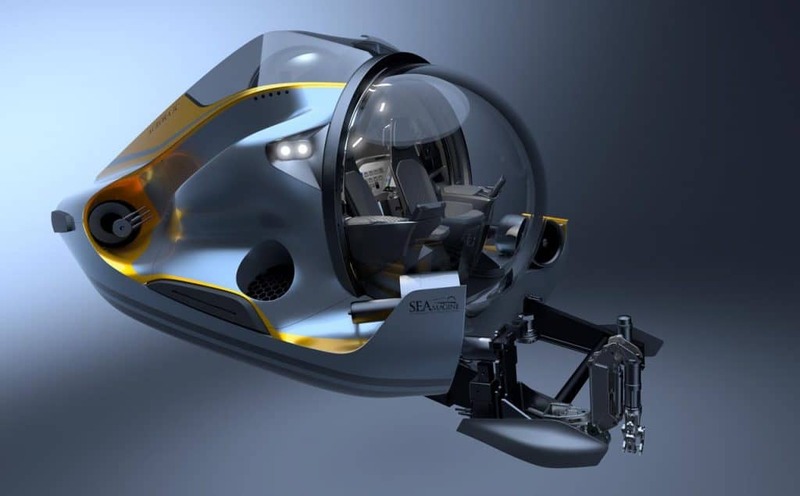 Compact and lightweight in design, this new, 3-person, luxury submarine offers the most spacious interior and comfortable entry arrangement in its weight category. With a diving depth of 457 m, this model has a dry weight of only 3,800 kg and its large, front acrylic window along with the second 180-degree hemispherical window integrated into the entry hatch offers passengers and the pilot an expansive field of view in all directions. Aboard the elegant, air-conditioned cabin, two passengers are seated in the front two luxury leather seats with the pilot sitting in the equally comfortable center-rear section. Each passenger seat features a leather-covered side armrest equipped with a, high-tech, user-friendly computer screen where passengers can choose between displaying diving depth and navigation data or streaming the HD video camera feed from the underwater camera located externally on the front of the craft. This fully electric vessel is powered by the latest lithium polymer battery technology and consists of 6000 m depthrated, pressure-balanced batteries installed externally in two separate oil-filled compartments, providing 40kWh of power. The Aurora-3C’s hydrodynamic design, equipped with six powerful propulsion thrusters, has over 600 kg of thrust, and the thrusters’ arrangement, controlled from a single joystick, offers ultra-high agility of movement under water in all directions. The remarkable amount of space within the very large entry hatch and the roomy entry area inside the submarine hull is a standout feature unique to the Aurora-3C which distinguishes it from any other, compact submarine designs.